The SAGA Convention in Hampton, Virginia, is over, and most attendees have packed and are off to home. I am staying over tonight as my flight to Denver is Monday morning. I had a wonderful time, meeting old friends and making new ones. Being in Northern Colorado, I'm a bit isolated from all of my stitching friends back in California, so it was nice to reconnect with them and those that I only see at Conventions. Several of the local chapters provide table favors with the meals, so this post will be show you what useful things we received. The theme for this Convention was "Anchored in SAGA" as it was held in Hampton, Virginia, on the East Coast. One of the chapters digitized the logo and embroidered it on felt to create needle books. There were also quilt clamps and a very large needle for making very large bullions. We were given smocking plates at three meals. Little sewn items: a luggage handle cushion with room for address information inside an acrylic window, a coaster in nautical theme fabric, and a tissue holder with elastic so it can be stretched over a car visor. The organza pressing cloth was actually a door prize I won (the only thing, alas), a very handy pleat counter and wax for sewing threads. I use a lot of wax so this will be handy. No, this wasn't a table favor. One of the ladies didn't manage to drink the beer she bought, so I'm bringing it home for Mr CS. I'm sure he will love it. He's been babysitting since I left on Monday so will be glad to get a bit of relief. I took four different classes all on embroidery, and I will blog separately about each one, which I hope will make me complete them. So, more to come! Oops, one last thing. Follow this link to the SAGA Smock Along FB page. The mayor of Hampton showed up to visit the Convention. He actually knew what pleating was and posed in front of the Wee Care gowns. What a guy! He did his own embroidery! Our pre day tour yesterday of Williamsburg focused on textiles, of course, with some behind the scenes tours. This gentleman was wearing a completely hand made outfit, complete with embroidery on the waistcoat and buttons that he did himself. I appreciate that they stay in character as much as possible, even to the extent of growing their hair long as appropriate to the period. When Mr California Stitching and I visited Williamsburg a few years ago, we could only see the looms standing idle with no one to explain how they were used. This time there were ladies who were actually weaving articles to be used in the compound. This lady is "tuft weaving" in which the warp threads are tied around the weft to make a fuzzy rug, similar to latch hooking. This rug will adorn a bed in one of the homes. This weaver is working on a horse blanket to keep one of the many horses warm during the winter. She is finished with one length, and is hemstitching the blanket prior to taking it off the loom. She will then weave another and join the two to make it double wide. Some examples of the dyed threads used in weaving. All are dyed using plant or insect material that was found in nature during the mid to late 18th century. To my non American readers: Williamsburg is a working 18th century compound in Virginia to show people what life was like for the first colonists. Well, maybe not the first, but subsequent generations. Not many of the first colonists survived. This lady is carding lambswool to get it nice and untangled so she can spin it into yarn. She explained that carding was mainly a job for children, to keep them occupied during inclement weather. This particular wheel is a treadle spinning wheel, which represents a three fold productivity increase over the older walking wheel. To operate the walking wheel, the spinner has to walk back and forth to get the yarn wound onto the shuttle. The treadle operator only has to pump the treadle while sitting, much easier! All of these photos were taken with the cell phone, as I stupidly took the camera connection wire out of my bag and placed it on the bed at home before leaving. I have to get back to my class now, and will take some photos with the cell phone this afternoon to share with you. The silk top is finished, thank goodness! As I mentioned in the last post, I'm making this using couture techniques, so there are lots and lots of hand sewing. I have made one dress using some of these techniques, but this is the first time I made a garment start to finish using couture methods. I really like inserting the zipper by hand, it gives you such great control. The pick stitch is amazingly secure. I practiced on a sample and I had to cut each and every stitch to be able to remove the zipper. I was very surprised at this, it is much more secure than machine stitching. I lined the top with this lovely silk charmeuse. This stuff is amazingly slipper and hard to control. Here I'm basting the sleeve lining in before sewing by machine. It took a few tries to get it right. The lining was inserted completely by hand, and using the pick stitch I under stitched the entire neckline lining. The Susan Khaljie Craftsy class was for a dress, and emphasized the need for a jump pleat at the hem (for a sheath dress only). I decided to try this with the top, but too many times I sewed the entire fold to the hem of the dupioni. So that needs to be redone if I want it to be right. And here it is finished. It's a bit snug on Phil, as I've lost some weight since I made the cover. I'll modify the cover at a later date. Now I'm rushing to get a skirt done before I leave for the SAGA Convention on Monday. I still need to pack and arrange all my sewing supplies. Also, we've been babysitting the grandson during the day. Too much to do!! I'm going to the SAGA Convention later this month, in less than two weeks in fact, and I decided to make a top and skirt for the annual banquet. I had the red dupioni on the right in the photo in my stash, purchased a few years ago during a shopping trip to the Los Angeles fashion district. The silk charmeuse for the lining came from Elfriede's Fabric Store in Boulder just last week. I purchased a Craftsy class, The Couture Dress by Susan Khalje and is it ever an amazing class! Susan has so much great experience and she explains why she does each step all along the way. Instead of a dress, I decided to try it out on a simple top. I'm using McCall's 7352, which is a princess seamed fit and flare dress. 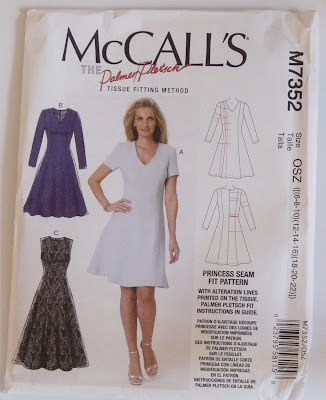 In this particular pattern, the princess seams go right up to the shoulder seam, instead of the ending at the armscye like most princess seamed patterns. If you remember, back in July I made a dress form cover using this same pattern, so I knew I had most of the fitting solved. In Susan's class, you first make a muslin, which I did all over again, ensuring that it fits properly, then use it for your pattern. I didn't take photos of the process, so I'll jump ahead to the construction. All the pattern markings are made on a silk organza underlining, rather than the red dupioni. Then the silk organza is hand basted along the stitching lines with silk basting thread. Silk dupioni can be rather difficult to work with and wear. It wrinkles easily and ravels ferociously! The silk organza underlining gives it great body and is supposed to keep it from wrinkling so much. The very large seam allowances, along with catch stitching the SAs to the underlining, keep it from raveling. This thread is rather difficult to find, especially as it's not made any longer but I managed to score three small spools at a flea market in Fallbrook, Southern California. There is also a Japanese thread that Susan recommends, which is also difficult to find. The thread I have is very soft and so easy to stitch with. The best part, however, is when you remove the stitching, there are no holes left in the dupioni. Here I'm basting the organza to the dupioni along the seam lines. After that is done, the pieces are basted together to make absolutely certain the fit is correct before machine sewing the top. Here is the basted top, with no sleeves, on my dress form, Phil (after my sewing grandmother). This is quite a time consuming process, but by focusing on the stitching lines rather than the cut edges, it's much easier to get a great fit. Well, that assumes I can fit myself, which is rather a challenge. The top is somewhat snug on Phil, because I fit it to myself, and now I'm one size smaller than I was in July when I made the dress form cover. Next up, machine stitching, removing the basting, pressing and catch stitching all the seam allowances. Then on to the sleeves.